Tiffany Blue Book! | All About Jewelry! Today’s post is centered around the most recent celebrity-studded event that Tiffany & Co. held to celebrate the launch of its 2013 Blue Book and subsequent collection at a ball at Rockefeller Center in NYC on April 18. With their first released in 1845, the Blue Book is an event which annually publishes and showcases Tiffany’s latest and most spectacular jewels. In its inception, it was initially designed to serve as a means of personal communication between the company and its top clientele as a means of reaching customers who may have needed a bit of enticement to visit the store. Soon after as with history serving as our vessel for hindsight, it has ballooned into the star studded event it is today. This year’s Blue Book features Tiffany jewelry primarily inspired by the Jazz Age, concurrent with the “Roaring 20s.” Jewelry from this period includes Art Deco designs, illustrated in streamlined and curved pieces, angular lines, and geometric shapes. Many of their pieces encompass the sheer creativity and vibrant energy of the jazz period. Here is a sneak peek at what we missed from the event. 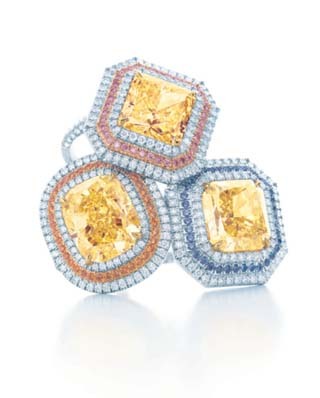 Tiffany yellow diamond rings (above) with pink and white diamonds and sapphires ($90,000 to $180,000). 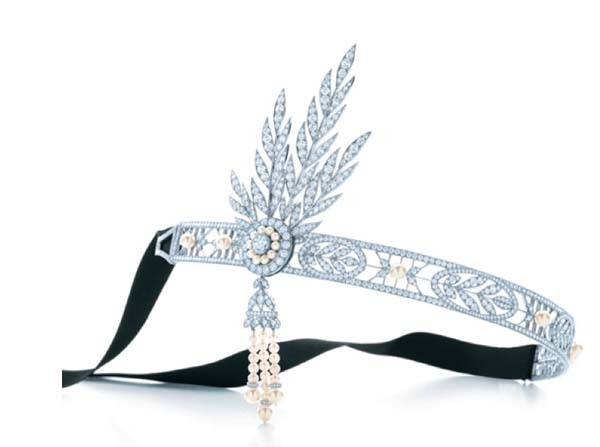 The Savoy headpiece, part of The Great Gatsby Collection, with diamonds and freshwater cultured pearls in platinum ($200,000) and can be acquired here. 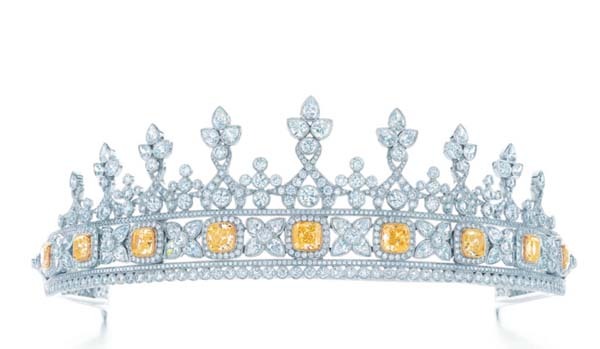 Tiffany white diamond tiara with 8.43 carats of yellow diamonds ($335,000) .